Even though I've accepted the mantle as the resident pop music fan in these parts, listening to SOPHIE was mandatory even if I wasn't so into the genre. 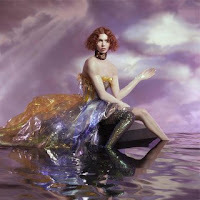 SOPHIE's genius is in deconstructing the expectations of what comes from pop music into its requisite parts and making an album that is as confusing as it is revolutionary. While some artists go fully into making weird, impenetrable electronic music and others (like Sia or Charli XCX) keep what might be their more strange instincts in check while producing radio-friendly hits, SOPHIE successfully straddles that line and instead creates something both with parts you'll grasp and parts that leave more questions than answers. No song does this better than "Faceshopping," which has a standard throughline to follow and a beat you can (mostly) keep up with, and is yet still as weird and absurd as anything else on the album. While it is not the strangest, or the most pop, or the most interesting, or the most endearing release of the year, its overall impact and how well it moves from idea to idea in its execution makes it one not to miss in 2018. Songs of note: "Faceshopping," "Ponyboy," "Whole New World/Pretend World."